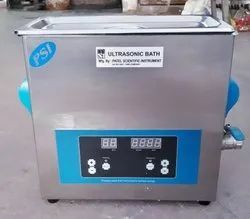 We offer Ultra Sonic Cleaner. These are widely used in Hospitals, Nursing Homes and Pharmaceutical Industry for cleaning various equipments. These are made under the guidance of our qualified engineers. Industries Applicable: - Hospitals, Nursing Homes, Educational Institutes, Electronic Industry, Jewelry Industry, Hotel Industry, Pharmaceutical Industry & Automobile Industry.